I enter the milonga. The lights are dim. The ambiance is mysterious, intriguing, dangerous and sexual. I sit down at table next to the dance floor and as I drink a glass of vinto tinto, I am drawn into the magnetic world of the dancers. I watch as the women seduce the men with the sensual movement of their back, hips, legs and feet, while the men try and control them in a firm, confident embrace. I examine how these two people create a story, a unique relationship while they dance. I become absorbed by their relationship and I realize I need to create one of my own. My love affair with tango began that night before I had even felt the seductive power of the embrace. I felt the butterflies in my stomach and when I left the milonga that night I had a longing desire to return. In the milonga the tables surrounding the dance floor are packed with different groups of people. Visitors who are just in Buenos Aires for a couple of weeks and new to the milonga scene, foreigners who have left their jobs at home and relocated to Buenos Aires for a couple months or a couple of years, Argentine milongueros with normal day jobs, who dance tango as a hobby, and the professionals who attend the milonga to make an appearance and schmooze. There are quite a variety of ages, nationalities and types who are all brought together with a common addiction—tango. In some way, we all crave the comfort and sensuality of the tango embrace. Is it something that is missing in our daily lives? Or do we just choose to indulge in this silent, enticing connection? With such a variety of people one would think that you could find some attractive people to look at or at least to speak to. But unlike in a bar or walking down the street where generally you notice someone based on their looks, in the milonga you are attracted to the best dancers. This attraction is so overpowering that often we find ourselves fantasizing about dancing with that person, we dream of their embrace. We follow that person night after night to various milongas and once we find them we stalk them so they know we are there and will ask us to dance. Once you embrace that special person and close your eyes and begin to dance, sometimes the connection is so powerful that you are transported to another world. In this world the most important thing is the connection, the embrace, the dance, the music, the feeling, the tango. We have fallen in love. But are we in love with the person with whom we share this connection, or are we in love with the tango? The music stops and the lights come up and we are shaken awake out of the surreal existence of the tango embrace. We look around and wonder, was it real? When I leave the milonga will I continue to think about this person, or rather the feeling of their embrace? 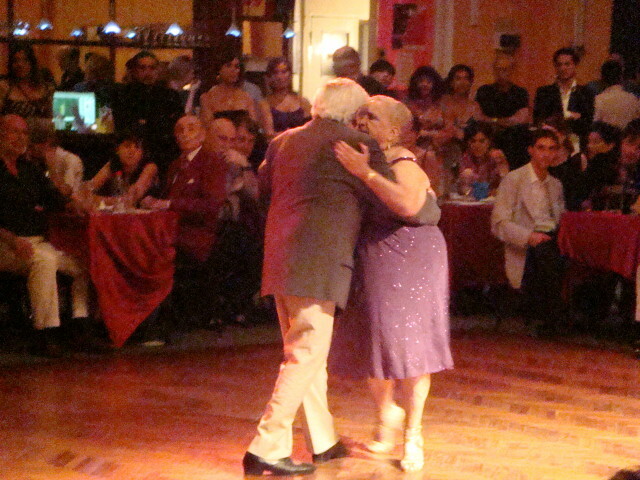 Often people’s relationships end when they start dancing tango or they fall into relationships with their dance partners. But are these relationships built on true love between two people or rather based on infatuation, sensual connection, or the mysterious, addictive connection and love they find through the tango? I fell in love with tango when I first witnessed it in a milonga in Buenos Aires 6 years ago. Before I even experienced the magnetic embrace, I was fascinated by the music, the clothes, the people, the dance and of course this powerful connection I could see between the two people dancing. I have fallen in and out of relationships with men in the tango world but my love for tango has remained. Sometimes I feel like tango is an addictive, overpowering relationship and sometimes it is even unhealthy. But when I experience wonderful dances I feel as if I’m flying and when I don’t, I feel empty, sad and depressed. If I think about ending my affair with tango I wonder if anything could take its place. The tango seduces me in a way that nothing else can. So my love affair continues, and I embrace it.